Likely the first mesures were made with a simple step. The primary reference for next mesures should be the length of a unique step. As we created a first and unique reference for measuring straight lines – we can name it “1 step” – we invented the idea of length for organizing our world and be able to compare distances. Later we wanted to be able to compare areas too; and we created a square with 4 unique steps – our referencial length. We can name the space inside of our first square a “square step”. We have now a reference for measuring straight lines and square areas. But we created our references with specific spatial coordinates. 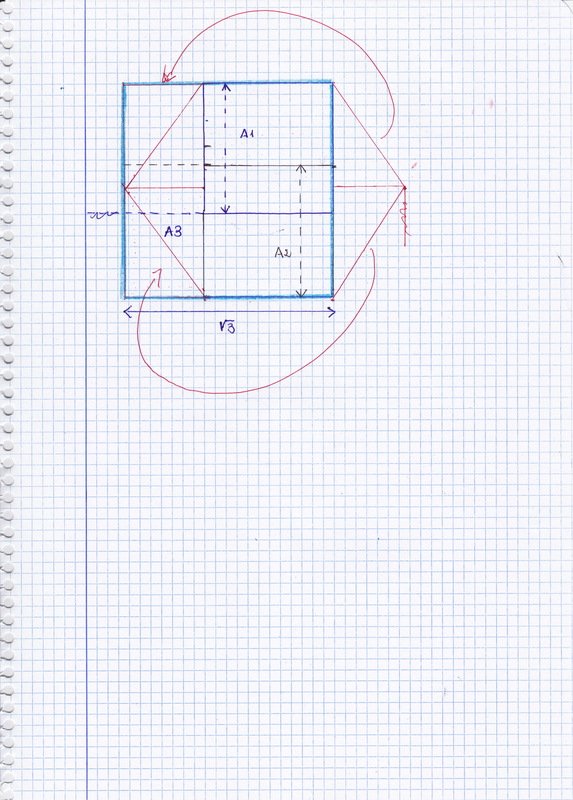 We can create new longer and proporcional squares respecting those square coordinates. 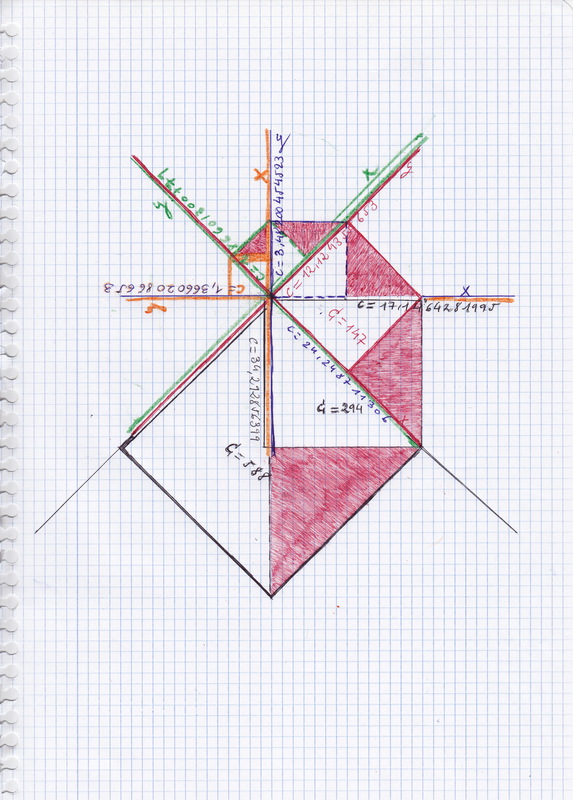 But if we trace a line changing our square referencial coordinates, for example a diagonal one, we will have changed the first referencial length that we created for measuring straight lines which we used for creating our first referencial square area. 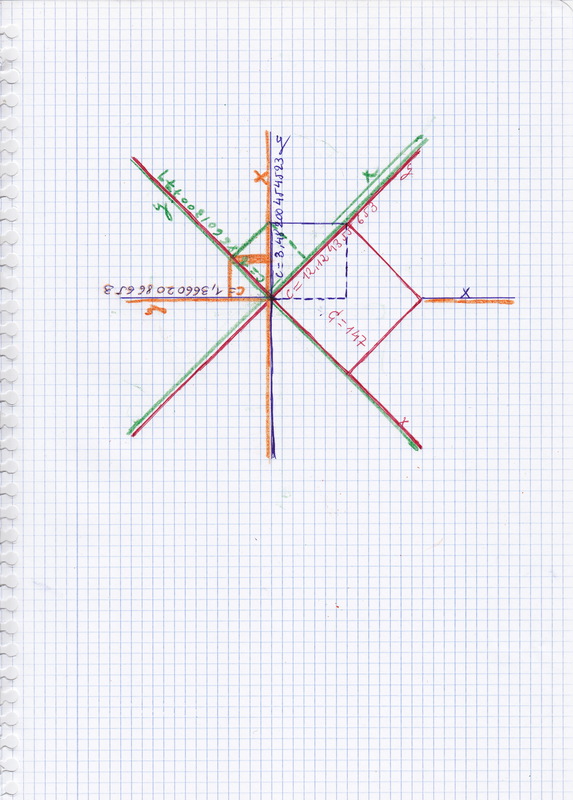 When we draw the diagonal we are changing the spatial coordinates, we are transforming our referential square space and changing the primary referential length. We can name this new length “hypotenuse”. But we can not consider that new length as something “irrational” because we caused the broke of its proportionality with our referential length when changing our referential coordinates without displacing our referential space too. We are using new coordinates referred to the old space. We can take the hypotenuse as reference for creating new squares, if we want to. But in that case, our square areas will be multidimensional. We can combine those two different kind of spatial references. And we can look for the proportionality related with the Fi number. And to use it as reference for creating new square areas. But coming back to our “history”: once we invented the length of 1 step as referential measure, we were able of counting one by one. So we have an invented square area of 1 which is a perfectly symmetric square (perfect with respect to our referential straight length of 1). Later we became aware that we can invent another referential length for counting two steps by two steps. 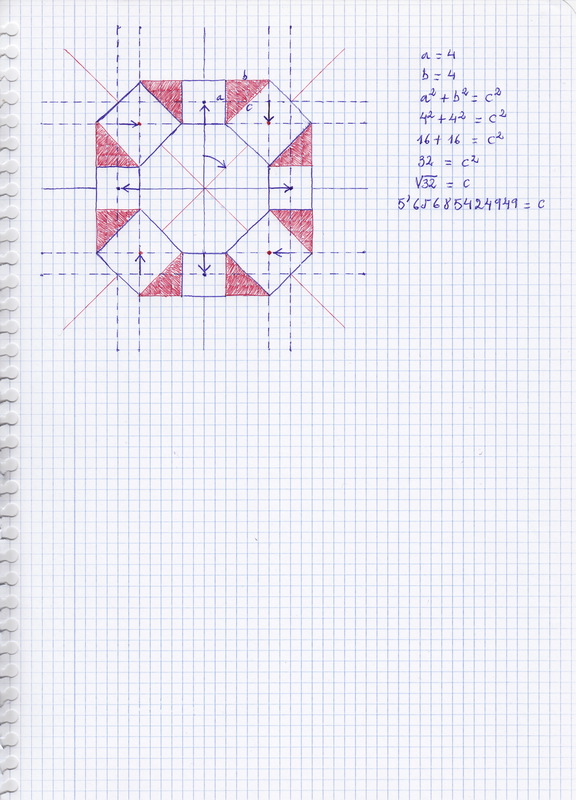 Two is symmetric and proportioned with respect to one; and we can invent a new referential square area with the value of two “square” steps; that new square of 2 is a perfect square with 4 square of 1 inside of it, it is totally symmetric and proportionated with respect to our original reference 1. To raise 2 to the square consists on creating a square with a side with the length of 2. 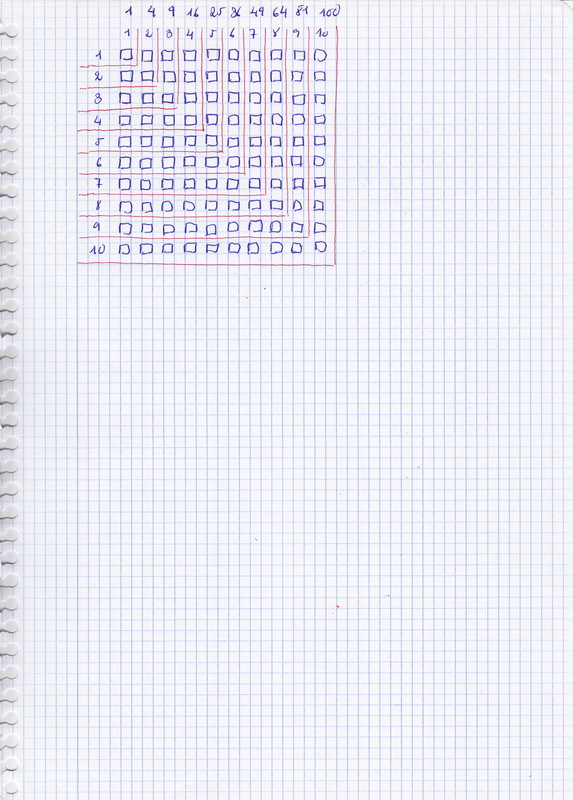 We get the result looking how many squares of area 1 are inside of that created square: we find 4 square areas of 1. So we have invented a prime or primary length of 2 and a prime or primary area of 2. We do not need to invent new references for 4, 8, 16, they all are proportional to 2. But in the case that after counting two steps we count only one (instead of two again), we will break the symmetry with respect to our referential length and square area of two. We need to create a new referential length and a new square area proportionated with respect to our first referential measures of 1. So we need to invent a new “prime” referential length of 1+1+1 which we will call 3, and a “prime” square area obtained rising to the square the length of 3. How many squares of 1 will contain the new square created with the length of three? a total of 9. If we want to calculate the square root of 9, we will need to make the contrary operation, we will need to find the length of the side we used for creating the big square which contains 9 square areas of 1, that is to say, the length 3. The problems arise when we want to calculate the root square of 3. We need to look for the side of a square inside of which there are 3 square areas of 1. We can get tose 3 squares of 1 eliminating one of the 4 squares of one that we obtain when raising 2 to the square. But we need to transform their container into a square area for measuring its side. We can build a hexagon with the obtained segments. The problem with the hexagon is the same that I commented before with respect to the hypotenuses, we are playing with multidimensional coordinates combined in the same space. Each time we trace a diagonal in our spatial square coordinates without moving the figure, we will be changing that coordinates without be aware that we are not displacing our referential space too. So if we use diagonals for constructing our squares we are going to change our referential lengths. For building a figure with six equal sides we deform our referential space contracting or folding it. 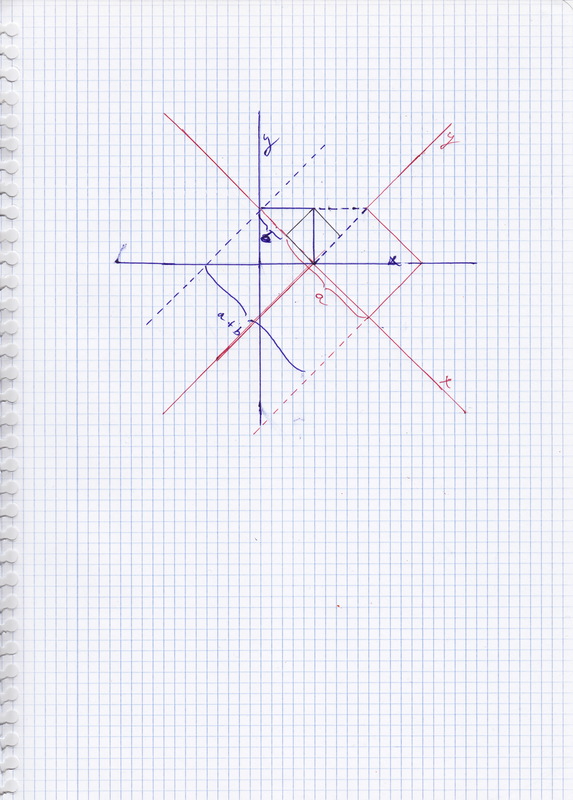 It occurs when drawing the diagonals. So the two square areas created inside of the hexagon overlap. The overlapped area is a rectangle.